How do you get a Mr Handy? 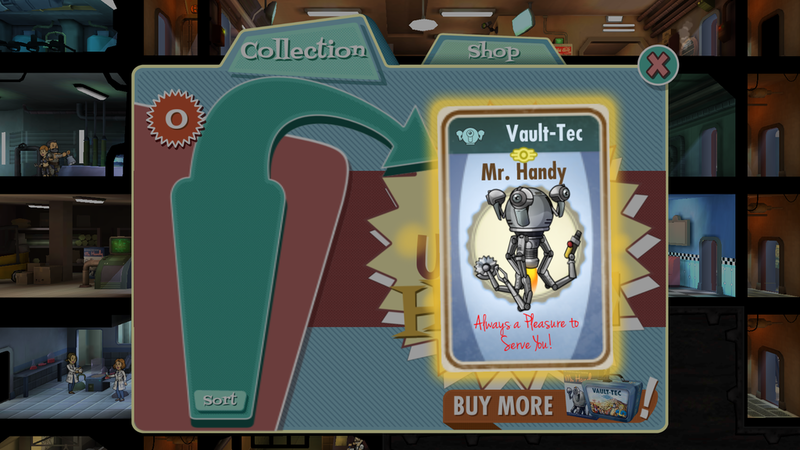 The new Fallout Shelter update comes with a new feature, the Mr Handy robot. How do you acquire them, and do they count as population? Mr. Handy is mainly a convenience item to automate some manual tasks (like harvesting rooms), and can be bought in the item shop for 0.99$. There is also a small chance to get him from lunchboxes. Not sure yet if they can be acquired otherwise. Rumours say that they might also be acquired in the wasteland, but that is yet to be confirmed. You can earn him from Mr. Handy Boxes, which are earned from Quests, Objectives, or buying them with real money, or you have a very, very, very, very small chance of earning them in a Lunchbox. They can be bought in the store gotten from lunchboxes gotten from finishing objectives, and as MrJre said possibly in the wasteland. Not the answer you're looking for? Browse other questions tagged fallout-shelter or ask your own question. How can I increase the strength of my Vault Dwellers? How do I use Stimpaks and RadAways on Dwellers in the Wasteland? How to make Caps efficiently? Are Mister Handy purchases tied to a save? If I configure my vault for cloud save, will the game require me to be online? How do I get more pets for my dwellers? How do I get Pet Carriers? In fallout shelter, after the quests update, can you get legendary dwellers from radio tower? How long do I have left to save Bottle & Cappy?